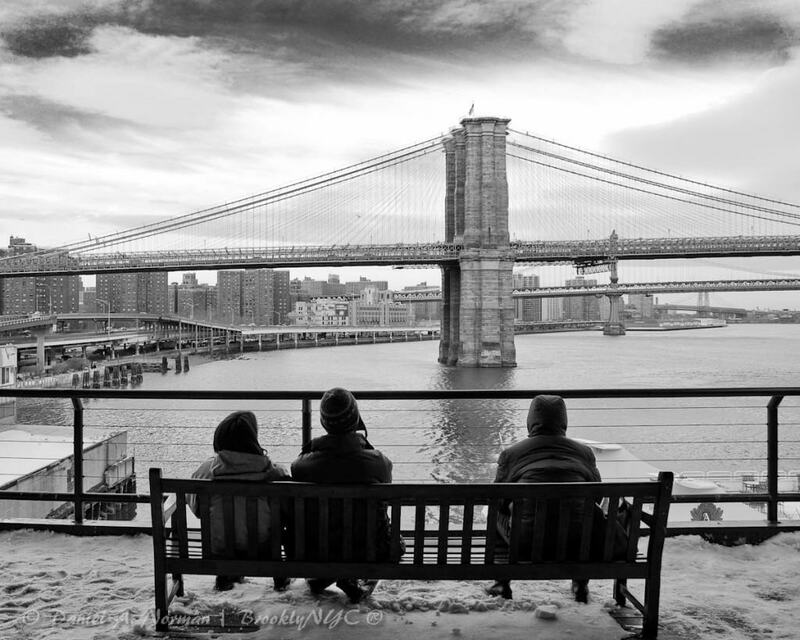 At the South Street Seaport, three people sitting on a bench enjoying the view of the Brooklyn Bridge, the Manhattan Bridge, the Williamsburg bridge, and the NYC city scape from the East river. This is a very special New York Photography image to me. It’s actually one of my favorite street photography prints. There is something magical happening in this image because it captured a quiet moment among the chaos in NYC. Pier 17 is no longer there. The old New York is changing, and NYC Street Photography allowed me to record some photos before a lot of the changes happened. There is a whole new public park near the South Street Seaport that offers some great views across the East River. Brooklyn is rapidly growing and is looking more and more like skyscraper Manhattan. This fine art photography image of New York captures a slice of New York. Every time I view this image, I’m inspired to take pictures of New York. This image is what New York Photography in all about. This image is what New York Street Photography is all about. Strangers are sharing a bench in Pier 17 in the South Street Seaport, sharing a view of the most beautiful bridge in the world, the Brooklyn Bridge. The Brooklyn Bridge is one of the most iconic symbols of Brooklyn NYC, and New York as a whole. I never get tired of looking at New York Photography of the Brooklyn Bridge, nor do I get tired of taking pictures of this New York icon. This New York Photography image was made into a limited edition fine art print for several International and local art photography expositions. This print is also included in a few private art collections. This entry was posted in New York Bridges and tagged art photography, black and white photography, brooklyn, brooklyn bridge, brooklyn nyc, brooklyn photography, new york photography, nyc, nyc street photography, pier 17, south street seaport, street photography, WATCHING THE BROOKLYN BRIDGE.